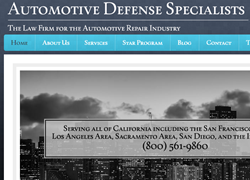 Automotive Defense Specialists is a California law firm focused on the rights of SMOG stations, STAR program participants, and technicians in the automobile repair industry. The firm has announced a new blog post about how a criminal defense attorney can assess the real threat of a citation letter from the Bureau of Automotive Repair. Allegations of potential criminal activity by the Bureau of Automotive Repair can appear to be threatening. Automotive Defense Specialists, a law firm focused on the rights of SMOG stations, STAR program participants, and technicians in California's SMOG check industry, is proud to announce a new blog post focused on how a criminal defense attorney can help if a SMOG station and/or technician may be facing possible criminal allegations by the California Bureau of Automotive Repair. To review the Automotive Defense Specialists new blog post please go to; http://automotivedefense.com/2018/03/27/serious-accusations-need-a-criminal-defense-attorney-to-show-the-bureau-of-automotive-repairs-true-colors/. To learn more about a criminal defense attorney with deep experience contesting the actions of California's Bureau of Automotive Repair, please review the page for the lead attorney, William Ferreira, at http://automotivedefense.com/about/williamferreira/. Here is the background for the release. Letters including STAR invalidations, SMOG test violations, interim suspension orders, and other issues set forth by the Bureau can be very confusing to the layperson. "Legalese" in these notifications might set up a person or company "for failure" because they simply do not understand what they are facing. A violation letter from the Bureau of Automotive Repair, for example, can appear to be threatening to a SMOG shop owner. Strong language indicating a case to remove a lucrative STAR certification could be concerning to an auto shop owner or dealership. It may be important to understand, however, that accusatory language might not equal a solid criminal case against a SMOG shop. A Bureau of Automotive Repair criminal defense attorney can help review the facts of a case and estimate the possible threat of losing in court. For these reasons, Automotive Defense Specialists have posted a new post to their blog regarding the true threat of a violation letter or other correspondence from the Bureau of Automotive Repair. After reading the post, however, the next best step is to reach out to a law firm that handles criminal defense against California's Bureau of Automotive Repair as no two situations are alike. The facts and the law must be investigated as a first step.